Fear is divisive. Bad news is divisive. Ignorance, bigotry, and isolationism is divisive. We are becoming increasingly divided. Now more than ever we need to remember what's important and why we care. And the more fundamental, more human, more urgent, and more intelligently articulated those things are, the more we might find common ground — in spite of our differences — for the sake of our common future. Starting in January, the International League of Conservation Photographers (iLCP) launched a global campaign called #1frame4nature with the legendary Art Wolfe's work from Alaska. The goal of the of project is to remind all of us to keep focused on what matters and celebrate positive actions — even a single frame — we can make to help keep improving the world. 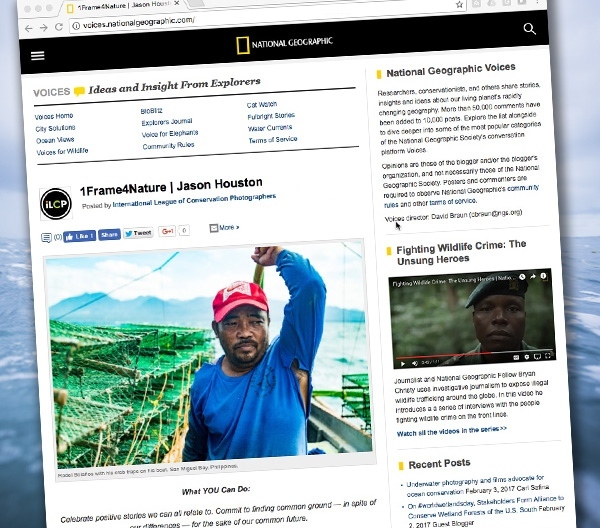 This week, my recent work from Caringo Island in the Philippines looking at the good work life-long fisherman and newly inspired activist, Rodel Bolaños, is doing to help reclaim his fisheries is featured on National Geographic's Voices blog.